Matching Dragoons: Jonah Hex #23 "The Massacre of the Celestials!" Jonah Hex #23 "The Massacre of the Celestials!" "The Massacre of the Celestials!" Jonah Hex sits astride his horse, overlooking a Chinese railroad work gang. He heads into a nearby town, looking for Big Dan Wallis. He asks around in the saloon, showing the barkeep a wanted poster. The barkeep freaks out because Dan Wallis has walked in behind Jonah, holding a shotgun. Jonah pulls out a stick of dynamite, lights it and throws it at Wallis. Wallis starts his own freak-out and Jonah shoots him dead, picks up the dynamite and tosses it behind the bar, commenting that it is an empty stick with a fuse jammed in it. As Jonah leaves, the barkeep tells the Chinese floorsweeper to drag Wallis's body out back and to clean the blood off the floor. Back at the railroad line, one of the workers addresses Samuel O'Rourke, the railboss, regarding missing back wages. They haven't been paid for 6 weeks. O'Rourke tells him to get back to work and the worker swings a sledgehammer at O'Rourke's head. Warned by a shout from another railboss, O'Rourke ducks and then grabs the worker, smashing his face into a rock and then shooting him twice. He tells the other workers to get busy but they refuse. O'Rourke tells O'Malley to take the workers to the paymaster's shed and that Mr. Gatlin will take care of everything. The workers are herded into a shed and then a wagon with a Gatlin gun is pushed to the shed and all of the workers are murdered. One worker not in the shed, Wing, sees what has happened and runs to a house. He is greeted by Mei Ling and Wing demands to see her father. Wing tells the old man of the massacre and the old man says that they must do something. Wing says that they are not fighters, what can they do? 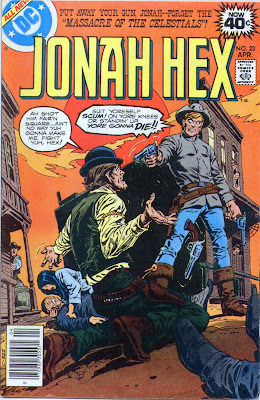 Just then Mei Ling's brother, the worker in the saloon, enters and tells about Jonah Hex. The father decides that he will approach Jonah and see if they can get his help. That night the old man knocks on Jonah's hotel door and when he enters, Jonah pulls a pistol on him. 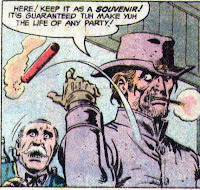 He explains the situation and offers Jonah Hex $30 to aid them in their revenge. Jonah refuses and the old man leaves. He is greeted in the street by Mei Ling and explains that Jonah would not help them. Just then O'Malley and two other thugs show up and start taunting the old man for not fighting his own battles. They offer a pistol to him and decide to go man to man in the street. With one of them holding Mei Ling back the gunfight starts. The old man aims his pistol and fires but the gun is empty. O'Malley, taking his time, pumps four slugs into the old man, leaving him to die in the street as Mei Ling runs to her father's side. Then the thugs decide to 'comfort' Mei Ling and that's when Jonah steps into the street. Jonah informs them that they have about ten seconds to live. The thugs start stammering that they have no argument with Hex, but two of them decide to draw on him. Jonah guns both of them down. The third one drops his gun and starts begging for his life, saying that he wanted no part of it. He gets a bullet right between the eyes. 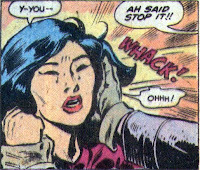 With her attackers dead in the street, Mei Ling runs to Jonah and starts beating at him, blaming him for her father's death. Jonah tries to talk sense to her but ends up having to slap her unconscious. He carries her to the hotel where the hotel manager tries to tell Jonah that Chinese aren't allowed. Jonah describes in detail what will happen if an empty room isn't found and the manager finds an empty room. Jonah takes Mei Ling to her room, lays her down and then goes to his own room and in a fit of rage, shatters the mirror. Several days later while the Ling family is mourning the loss their father, Jonah pays a visit to Mei Ling. Jonah apologizes for causing her father's death, but Mei Ling explains that they believe that he is in a far better place along with their ancestors. Jonah comments that he would feel better if he believed that, but he doesn't believe in nothing. Later on, Mei asks Jonah why he became a bounty hunter and he says that it was just thrust on him. Things normally turn out all right, but sometimes things like this happen. Mei Ling says that Jonah should listen to his heart and put his guns away, she can see that deep inside he is not a violent man. Later, they have dinner together and some nearby gossips are having a field day with the bi-racial dating going on. Of course, they are seen by one of the evil Irish rail bosses, who tells O'Rourke all about it. Several hours later, as Mei Ling is leaving the outhouse, she is kidnapped. Later a boy delivers a note to Jonah's hotel room, explaining that Mei Ling has been kidnapped. He straps on his guns, and commenting on how Mei Ling wants him to abandon his firearms and how it's hogwash, heads off to rescue her. On the outskirts of town, the three men have Mei Ling bound by a campfire. They decide to fan out and when Jonah comes riding in through the pass, they'll open fire. Jonah manages to sneak up on the guy watching the South entrance. Later, the two watching the North entrance see Jonah riding into the canyon and open fire, knocking Hex off of his horse. When they crawl down from the rocks and roll the body over, they discover they have just shot their partner. Jonah had gagged him, dressed him in Hex's clothes and then tied him to the horse. Jonah is standing behind them and as they turn, he kills both of them, but not before one gets a shot off that hits Jonah's left shoulder. Jonah unties Mei Ling. He stands there and starts to say that he loves her. Mei Ling stops him and explains that he really loves the gentleness within himself that he is also afraid of. She tells him goodbye and Jonah rides off. Timeline - Hmmm, this one is tricky. All of the research I could find on Chinese rail workers pointed to the building of the Transcontinental Railroad that was completed in 1869. I did find a reference or two to workers in Texas as late as 1881. No telling when this takes place. It's after 1866 and before 1876. As a story goes, I am torn on this one. At times it reads like a schmaltzy romance novel with Mei Ling talking in ancient Chinese wisdom (gack!) and other times I enjoy it, because Jonah is confronted with something he hasn't had to face before, someone who sees past the violence he inflicts on society. But it is the start of the Mei Ling saga (sorry if I ruined any surprises here) and it does open the door to some of the more interesting Hex stories later on. It is nice to see different ethnic groups in the old west and the contributions (both good & bad) that they made to this country. Next Issue: Jonah repents and starts preaching the Good News! Oh, and an Indian Fire demon shows up as well. Oh man, Mei Ling just drives me nuts.